It’s difficult to imagine what Ottawa would look like without the Rideau Canal. In its absence, this area of the province would likely be a defunct logging town cradling the confluence of various rivers — perhaps sought only by hikers and backpackers longing to catch a glimpse of the mostly untarnished beauty of the surrounding landscape. Ironically, that’s just what’s happened in spite of the 202-kilometre canal being built against long odds. Today, it acts as a magnet for skaters, boaters, kayakers, canoeists, and campers. 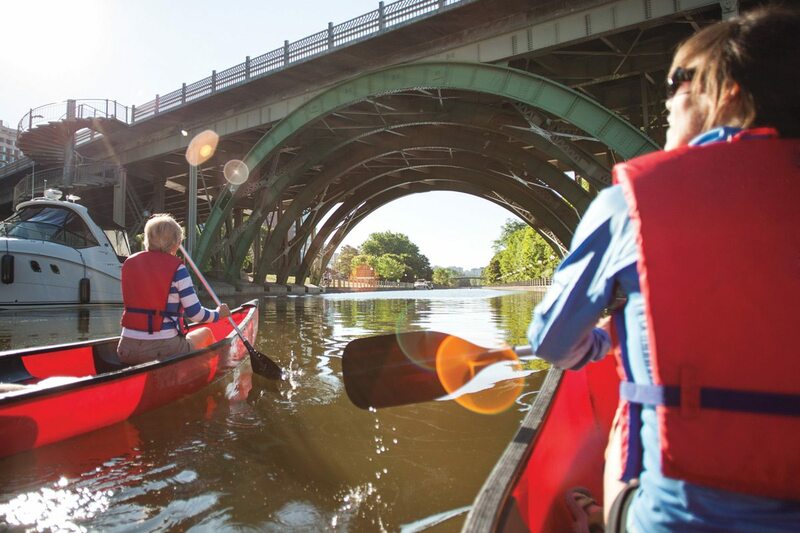 But even for longtime residents, there are always new ways to explore the waterway. The Keen Kayaker “… [T]he whole art of cannaling” as an Irish emigrant sang in the 1800s ballad “Paddy on the Canal,” is truly by watercraft. 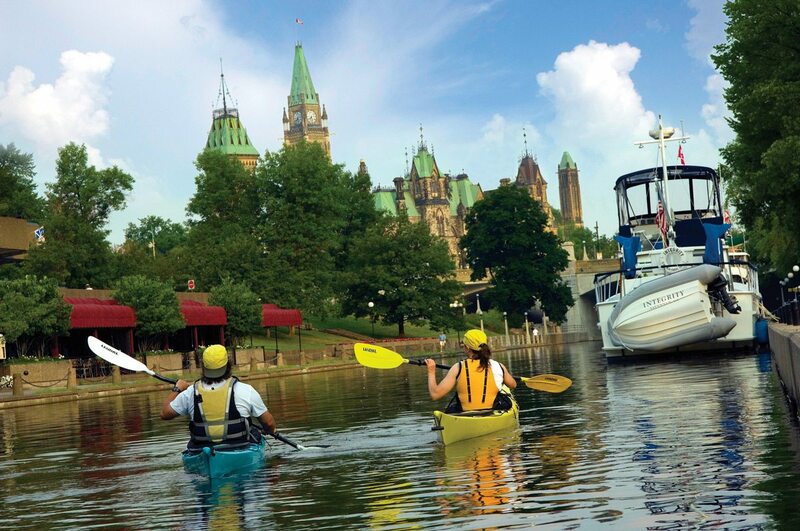 The more experienced paddler is advised to choose a kayak over a canoe, given the former’s ability to better handle rough conditions, especially on Big Rideau Lake, Upper Rideau Lake, Colonel By Lake, and the River Styx (the name of another place where you might end up if you don’t heed said advice!). Though much of the canal is along narrow channels, sometimes sheltered by surrounding foliage, there are some more open spots where winds can pick up, creating serious chop. Another recommendation is to paddle from Kingston to Ottawa, given that the prevailing winds typically blow from the west/southwest. Lockstation Camping After a long day of boating, one needs a place to rest their weary head. Lockstation camping, or “boating camping,” is an option at 24 of the 26 locks. Pitch a tent beside the canal or on the adjacent lawns. Or you can glam-camp by reserving oTENTik tents. New to the park in 2016, these are a cross between a cabin and a tent: they have a wooden A-frame, which includes bunk beds and tables, with a canvas roof. These are available at locks 19, 34, and 44. Sweet dreams! The Rideau Trail extends from Kingston to Ottawa and is 327 kilometres one way! The trail takes hikers to Murphys Point Provincial Park, where a working mine closed in 1920. Now spelunkers can descend 20 metres into the 40-metre shaft to glimpse “icing glass” mica, the diverse flora that thrive in the cool climate at the bottom, and massive sheets of ice that can be seen well into August. The Cataraqui Trail, which is part of the Trans Canada Trail system, extends from Smiths Falls to Napanee and is “only” 103 kilometres. This one is easy to hike (or bike), as it follows an old railway bed (the last train to traverse its tracks was in 1979). It’s open year-round and, along the way, takes hikers close to a cheese factory, an art gallery, and the Queen’s University Biological Station.